As the last days of 2015 tick away, I wanted to share how I came about my new lab environment without spending a fortune. Some of you might want to set some goals for the new year and this might be some interesting input. My focus for this lab was that I wanted it to be not only friendly on budget, but also low on installation effort and support. It should work out of the box, it should be supported by the vendors (in this case, HP, VMware and QNAP) and it should not be rocket science to put it all together. If you want to use this article to compose a list of items to purchase, you can find a list of all the items described here below the article. Of course, I call it a lab, but when you look at the specifications, this configuration easily serves any small or even medium business needs. Curious what’s in the box? Let’s go! Not so long ago, Erik created his own new lab environment. He choose to pick low power low key systems as his hosts. Check his article here. He picked Shuttle barebones and added hardware to it. My goal however, was using something that has both hardware vendor and VMware support. So I started looking for a low power server and I found the Hewlett Packard Proliant Microserver. Now, I’ve seen this little cube before, but back then it was not as economical as this version was and the performance left a lot to desire. This version however, the Gen 8, packed enough punch to run several VMs without breaking sweat. What I liked most about this little cube is the fact that it is supported for VMware. But apart from that, it offers some genuine server technology for a super eco pricepoint. 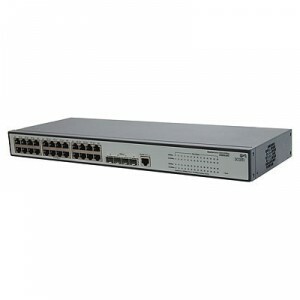 It has Integrated Lights Out (ILO) management, it has two network interfaces, it has an onboard SD-card slot from which it can boot, it has a PCIe slot where you can add another NIC. The Microserver comes in various hardware configurations with different CPUs, ranging from low power low budget Celeron up to a powerfull Xeon E3. The only downside to this box is the fact that it “only” supports 16 Gigs of RAM. This might sound like more than enough, but if you add 3 Windows VMs with 4 Gigs each, you are soon nearing the end of resources. Then again, if you have 3 of these boxes like we have in this lab, you can have quite the serverpark without getting into trouble. 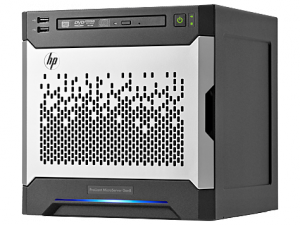 More specs on the internals and limits can be found at the HP website over here. So there you have it. A fully configured server with 4 NICs, 16 GB RAM and full support by HP and VMware for under 500 dollars. 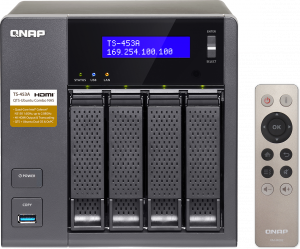 More info on the QNAP TS-453A can be found here. As you can see, the pricetag is still an amount to recon with, but compared to having at least 2 disks plus 1 SSD in each host, this is the cheaper version with a lot of punch packed. More information on the v1910-24G can be found here. Now, I’m assuming you will install VMware on it. As this is focussed on SMB or a Lab environment, I assume you guys out there will not spend tens of thousands of dollars or euros on vSphere 6 With Operations Enterprise Plus. For the sake of economy, I will add vSphere Esssentials Plus Term License to the mix. This way you will have all the fancy features with a limit of 3 hosts. 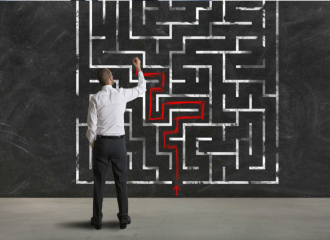 Term license offers an additional option for customers with smaller IT budgets. The price includes the product license and Basic support & subscription for 1 year. So there you have it. 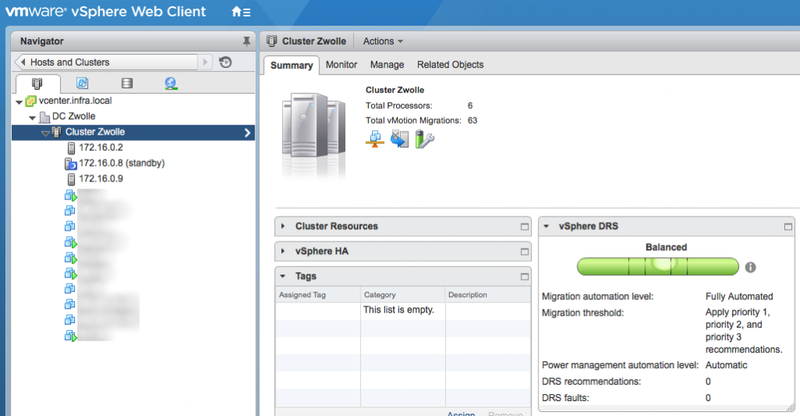 A full featured, fully supported 3 node cluster with VMware for well under 6K! This is a cluster that can easily run any SMB or Lab core infrastructure on a day-to-day basis and leave room for more. Of course more servers can be added, if need be. Keep in mind though that the VMware Essentials Plus license only allows for 3 hosts. You might want to switch license plans if you need more processing power or pick a more powerfull servermodel, i.e. the Xeon E3 version. In the next section I will go into the installation and configuration of the components and show you a few performance statistics. Below you will find a list with the components described in this article for your purchase list.